As part of an effort to determine whether and how to regulate tobacco product sales, this past week, the US Food and Drug Administration (FDA) opened a 60-day comment period to obtain information from the public on whether menthol cigarettes should be regulated. The FDA also released an independent report entitled “Preliminary Scientific Evaluation of the Possible Public Health Effects of Menthol Versus Nonmenthol Cigarettes”. The report, in PDF form, is available for free here. The report noted that menthol cigarettes constitute about 25% of cigarette sales in the US and that cigarette smoking leads to more than 400,000 deaths annually in the US alone. Globally, the World Health Organization reports about 6 million deaths annually caused by cigarette smoking, a figure expected to rise to more than 8 million per year by 2030. The FDA report analyzed existing research to determine whether there are differences between menthol and nonmenthol cigarettes in terms of smoking chemistry/toxicity, physiological effects, biomarkers of exposure, patterns of smoking, consumer perceptions, smoking initiation and progression to regular use, nicotine dependence, ability to quit, and disease risk. Existing scientific evidence included in the report does not support major differences between menthol and nonmenthol cigarettes in a number of key measures, including smoking biomarkers, toxicity, consumer perceptions, or disease risk. However, the report concluded that menthol cigarettes induce different physiological responses, are associated with earlier initiation and progression to regular use, induce greater smoking dependence (menthol smokers are more likely to report smoking their first cigarette within 5 minutes of waking up), and make it harder to quit smoking than nonmenthol cigarettes, especially among African American smokers. Recent research may shed some additional light on these conclusions. A 2013 analysis of data from the National Health and Nutrition Examination Survey (NHANES, 1999-2010) determined whether differences existed between menthol and regular cigarette smokers in blood or urine toxic biomarkers of smoking. Data from more than 4,600 adult smokers (1,393 menthol cigarette smokers) showed that menthol smokers exhibited significantly higher blood cadmium concentrations, although upon stratification of the sample by race, the association was found to be significant only in smokers who were White. The report also suggested that there may be ethnic differences in effects of menthol cigarette smoking, as among African Americans, menthol cigarette smokers exhibited higher blood lead levels and among Mexican Americans, menthol cigarette smokers exhibited higher urine NNAL (4-(methylnitrosamino)-1-(3-pyridyl)-1-butanol) levels. This study provides new evidence that there may be differences in toxic biomarker levels between menthol and nonmenthol cigarette smokers. 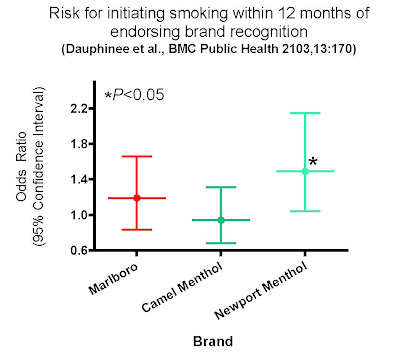 With regard to marketing of menthol cigarettes, a large longitudinal 2013 study of nearly 1,200 6th–9th graders in a racially diverse California school district concluded that nonsmokers who recognized the Newport brand (a menthol cigarette) were 50% more likely to initiate smoking within 12 months, regardless of race (Figure). 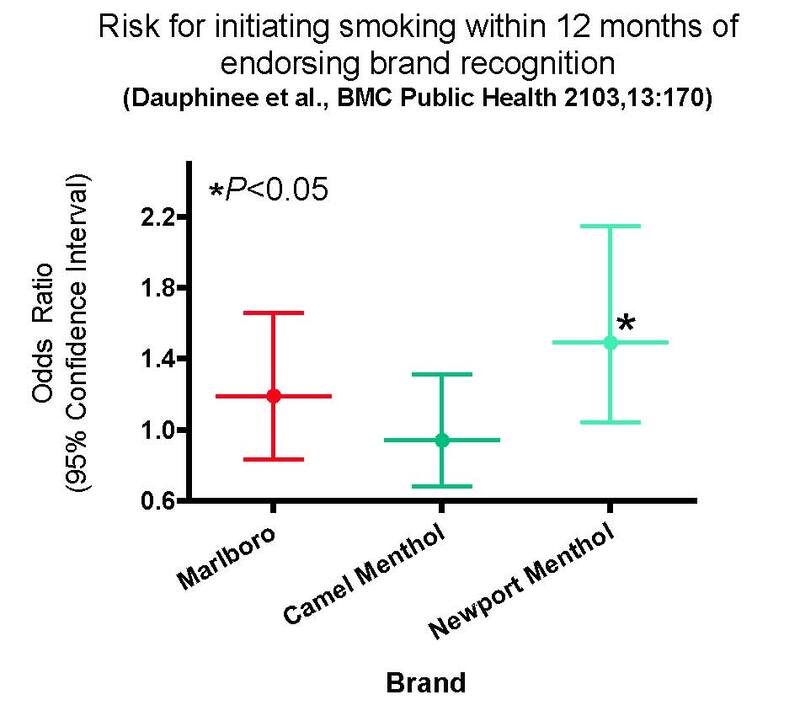 By contrast, recognition of Camel menthol or Marlboro nonmenthol brands was not associated with smoking within 12 months, leading the authors to propose that point of sale advertising of Newport brand cigarettes be controlled. A PDF of the full report can be found here. This study provides new evidence that consumer perceptions, actually, potential consumer perceptions, can lead to smoking initiation differences. As more studies emerge comparing effects of menthol to nonmenthol cigarettes, it seems clearer that menthol cigarettes are associated with greater danger for early smoking initiation and increased exposures to toxic compounds. Prior CPDDBLOG coverage of the menthol cigarette issue can be found here, here, here, and here.